Blue Raster is pleased to announce the launch of AmphibiaTrends application for National Biological Information Infrastructure (NBII) – a part of USGS. Using ESRI ArcGIS Server and the Flex API, this application is a single source for information about the status and trends of U.S. amphibians. It provides one-stop access to information from diverse sources, including contextual information about natural history, taxonomy, and distribution, all within a single site for Amphibians in North America including frogs, salamanders, and newts. Land managers and natural resource decision makers and researchers want to know about the status and trends of amphibian populations in the U.S. Numerous amphibian monitoring programs collect this information at the national, regional and local levels. 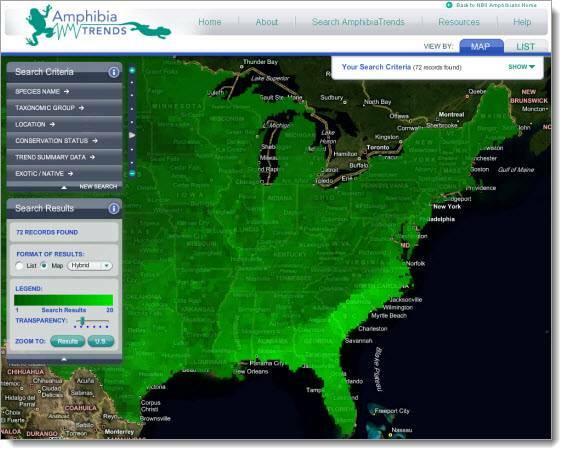 AmphibiaTrends brings them together into one site, to give you easy access to current trends and status of our nation’s amphibians. Search by species, location, conservation status, or taxonomic order to view reports including distribution maps, detailed species and habitat descriptions and the latest trend information from the experts. Visit AmphibiaTrends today.